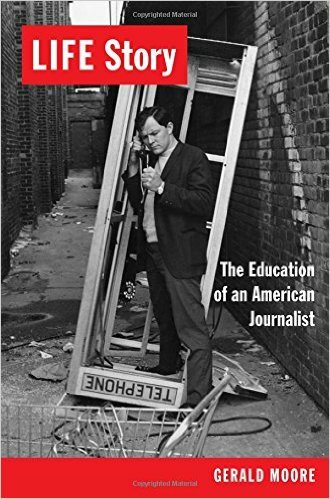 Gerald Moore, former Albuquerque Tribune reporter, will be at Page One Books at 4pm on Saturday, April 30, to talk about and sign his non-fiction effort, LIFE Story: The Education of an American Journalist. The book is described as such: "Before Americans got their news from television, they got it from LIFE, the weekly magazine that set the standard for photojournalism. In LIFE Story, Gerald Moore, a writer and editor who worked at the magazine in the last glory years before TV made it obsolete, recalls the dizzying excitement and glamour of LIFE's fast-moving, powerful approach to spreading the news. Moore covered the major stories of the late 1960s and early 1970s: LSD, assassinations, the 1968 Democratic convention in Chicago, the McCarthy campaign, urban riots, the My Lai massacre, and the beginnings of feminism. His story offers a wonderful look back at the good and the bad old days of journalism." Moore joined the staff of LIFE at the age of 27. Before that, he was a philosophy student at the University of NM who became a nighttime police officer and then a reporter at The Albuquerque Tribune in the 1960s, both jobs teaching him the tools of his trade. At LIFE magazine, he was a leading reporter, bureau chief, and eventually an editor. When LIFE ended publication as a weekly magazine in December of 1972, Moore turned to freelance magazine writing. His articles appeared in People, Saturday Evening Post, Reader’s Digest, Families, Horticulture and other national magazines. Moore lives in Hudson, N.Y., and Chapel Hill, N.C. Page One Books is located at 5850 Eubank NE, Suite B-41, in Albuquerque's Mountain Run Shopping Center (southeast corner of Eubank and Juan Tabo). The Moore event is free and open to the public. For more information, please call 294-2026 or visit [link].